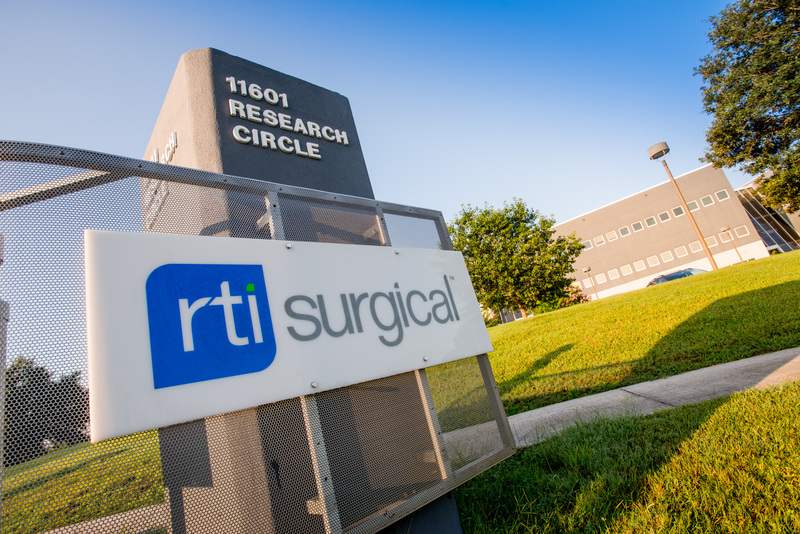 RTI Surgical® Distributes Proxy Material and Letter to Stockholders - RTI Surgical Holdings, Inc.
ALACHUA, Fla. (April 19, 2016) – RTI Surgical Inc. (“RTI” or “the Company”) (Nasdaq: RTIX), a global surgical implant company, announced that it will be distributing proxy material and the following letter to RTI stockholders urging them to protect their investment in RTI and vote the WHITE proxy card FOR the election of Peter F. Gearen, Brian K. Hutchison, Thomas A. McEachin, Jonathon M. Singer, Paul G. Thomas, Nicholas J. Valeriani and Shirley A. Weis, RTI’s highly qualified director nominees, at the Company’s upcoming annual meeting of stockholders on May 26, 2016. Messrs. Gearen, Hutchison, and McEachin and Ms. Weis are existing directors. RTI’s independent nominating and governance committee conducted a thorough evaluation to identify director nominees with the right skills, qualifications and experience to help grow value for all RTI stockholders. The nominating and governance committee unanimously determined that RTI’s director nominees are the best leadership team to direct the business and increase long-term stockholder value. The committee carefully reviewed the experience and qualifications of all of Krensavage Partners, LP’s (“Krensavage”) nominees, consistent with its standard process used to evaluate all potential director nominees and determined that Krensavage’s nominees lack the necessary qualifications to serve on the RTI board. RTI is committed to stockholder engagement and a governance framework that supports the creation of long-term stockholder value. The nominating and governance committee continually reassesses RTI’s board composition and when RTI’s three new director candidates are elected to the RTI board at the upcoming annual meeting, RTI’s board will have undergone significant change, as seven of RTI’s nine directors will have served in their positions for less than three years. RTI is always open to constructive input from its stockholders. RTI delayed its annual meeting in order to give the nominating and governance committee sufficient time to conduct interviews with the candidates that Krensavage initially proposed. RTI is making significant progress executing its plan to grow revenue, increase profit margins and enhance stockholder value. The Company has the strategy in place to become a $500-million-revenue company by growing revenue faster than the market with gross margins approaching 60% and operating margins approaching 20% of total revenues. 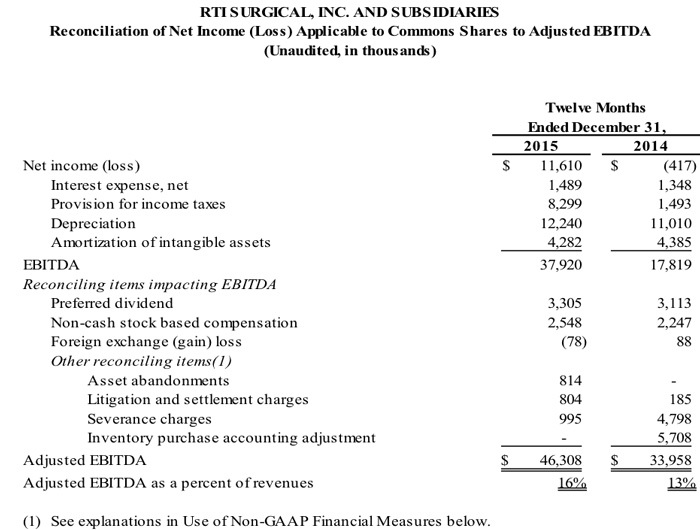 RTI Surgical’s (“RTI” or “the Company”) upcoming annual meeting of stockholders on May 26, 2016 will be critical in determining the future of your company. A dissident stockholder, Krensavage Partners, LP (“Krensavage”), has commenced a proxy fight to solicit votes to replace four of RTI’s seven highly qualified director nominees with four Krensavage nominees. Our independent nominating and governance committee unanimously determined that Krensavage’s nominees are less qualified than RTI's nominees to be directors of your company. The committee carefully reviewed the experience and qualifications of all of Krensavage’s nominees, consistent with our standard process used to evaluate all potential director nominees. The Company’s annual meeting was delayed to conduct interviews with the candidates that Krensavage initially proposed and one of those nominees has subsequently been withdrawn by Krensavage from the nominating process and replaced with a new nominee. On April 12, 2016, well after the nominating and governance committee had concluded its search process, Krensavage notified the Company that it had decided to replace John Watts, one of its initial nominees, with Darren Lehrich. The committee has reviewed Mr. Lehrich’s credentials submitted by Krensavage and has unanimously concluded that Mr. Lehrich lacks the essential skills and relevant experience for membership on RTI’s board. The committee also believes that the late substitution of Mr. Lehrich, who is clearly less qualified than RTI's nominees, underscores the disorganized and last-minute approach that Krensavage has displayed throughout its engagement with the Company. We urge RTI stockholders to vote FOR the election of RTI’s highly qualified nominees: Peter F. Gearen; Brian K. Hutchison; Thomas A. McEachin; Jonathon M. Singer; Paul G. Thomas; Nicholas J. Valeriani and Shirley A. Weis. Messrs. Gearen, Hutchison, and McEachin and Ms. Weis are existing directors. We believe our nominees have the right mix of qualifications, experience and skill sets to successfully direct RTI and oversee our strategy to create long-term value for ALL RTI stockholders. We are committed to ensuring that RTI has a strong board and the nominating and governance committee consistently has taken steps to strengthen the board. The result is meaningful change and a strong and refreshed board. We see further strengthening when RTI’s new director candidates, Messrs. Thomas, Singer and Valeriani, are elected to our board at the upcoming annual meeting. With this change, seven of our nine directors will have served three years or less. We believe the guidance and leadership of this strong and refreshed board will help us execute our strategic plans to grow, improve profitability and enhance value for all RTI stockholders. We believe RTI is at an important moment in our history. As we expand revenue from higher-growth, higher-margin products, we expect annual revenues in the future to grow faster than the market with gross margins approaching 60% and operating margins approaching 20% of total revenues. RTI’s board nominees are committed to continuing on this path towards enhanced long-term value creation for ALL stockholders. In contrast, in discussions going back several months, Krensavage has failed to offer any specific plans or ideas to increase stockholder value. It is critical that you vote the enclosed WHITE proxy card today to protect your investment, and disregard any proxy cards that you might receive from Krensavage. Over the past several months our nominating and governance committee, consistent with its standard practice and with the assistance of an external search consultant, has conducted a thorough evaluation of many potential director candidates to identify individuals who possess the right qualities and expertise to help enhance stockholder value. The committee’s robust process included a review of relevant business experience, an assessment of skill sets, in-person and telephonic interviews and discussions, and extensive background and reference checks on each of the proposed candidates. The committee thoroughly evaluated all candidates, including those proposed by Krensavage, against the pre-determined set of criteria that was established by the board ahead of commencing the evaluation process and before Krensavage proposed any of its candidates. These criteria generally include a candidate’s understanding of RTI and its business and industry, proven judgment and skills, depth and breadth of professional experience or other background characteristics, independence, and willingness to devote the time and effort necessary to be an effective board member. Upon completion of this thorough process, the committee identified and unanimously determined our proposed nominees to be the best candidates for election as board members to help us execute our strategic plan and enhance value for our stockholders. We believe RTI’s slate of nominees has the right mix of experiences, qualifications and skill sets to oversee the continued execution of our strategy and increase value for ALL stockholders. Election of the Company’s slate will result in a board with eight independent directors out of nine, including two directors associated with our largest preferred stockholder and investor with the largest economic stake in the Company (Water Street Healthcare Partners). We also have separate CEO and chairman roles, with our current Chairman elected earlier in 2016. Jonathon M. Singer: We believe Mr. Singer’s financial background (particularly as a sitting chief financial officer of a publicly-traded company and as a certified public accountant with experience at a big four accounting firm) and life sciences experience makes him well-qualified to serve on our board. Mr. Singer has served as CFO of Sagent Pharmaceuticals since September 2011, and was appointed executive vice president and CFO in March 2012. Mr. Singer was senior vice president, treasurer, secretary and CFO of Landauer Inc. from 2006 to 2011. From 2004 to 2006, Mr. Singer served as vice president of global finance and CFO of the Medical Segment for Teleflex Inc. Prior to 2004, Mr. Singer worked in various capacities for R.R. Donnelley & Sons, Cardinal Health Inc., and KPMG LLP. Paul G. Thomas: We believe Mr. Thomas’ extensive leadership experience with companies in the life science industry qualifies him to serve as a member of our board. We regard his experience as a CEO to be of great importance to the Company in providing a broad perspective of the industry. Mr. Thomas was the founder of Roka Bioscience Inc. and has served as its CEO since September 2009. He also sits on the board of directors of Roka Bioscience. Prior to Roka Bioscience, Mr. Thomas previously served as chairman, CEO and President of LifeCell Corporation, a publicly traded regenerative medicine company, from 1998 until it was acquired by Kinetic Concepts, Inc. in 2008. Prior to joining LifeCell, Mr. Thomas held various senior positions during his tenure of 15 years with Ohmeda Inc., a world leader in inhalation anesthetics and acute care pharmaceuticals. Mr. Thomas currently serves on the board of directors of AbioMed Inc. and Aegerion Pharmaceuticals Inc.
Nicholas J. Valeriani: We believe Mr. Valeriani’s experience in the global medical device industry and his leadership in the areas of strategy, growth and human resources makes him well-qualified to serve on our board. Mr. Valeriani’s prior experience includes serving as the CEO of West Health, The Gary and Mary West Health Institute, a position he held from 2012 to 2015. Previously, Mr. Valeriani served 34 years in key positions at Johnson & Johnson, including company group chairman of Johnson & Johnson Ortho-Clinical Diagnostics from 2009 to 2012; vice president, Office of Strategy and Growth from 2007 to 2009; and, prior to 2007, as worldwide chairman, Medical Devices and Diagnostics, and corporate vice president, Human Resources. Mr. Valeriani also served on the Executive Committee of Johnson & Johnson during his tenure. Mr. Valeriani currently serves on the board of directors of Edwards Lifesciences Corp., Roka Bioscience Inc., as well as the Robert Wood Johnson University Hospital. In addition, the board has recommended the re-election of Messrs. Gearen, Hutchison and McEachin and Ms. Weis. These directors, who have accumulated deep experience in the healthcare sector and as directors of publicly held companies, have proven to be active and engaged members of our board and have all made significant contributions to our business. Peter F. Gearen, M.D. : Dr. Gearen joined our board in 1998 and was appointed vice chairman of the board in February 2016. Dr. Gearen has a depth of medical experience and healthcare knowledge and, as a former practicing orthopedic surgeon, is knowledgeable about our products and the orthopedic products market in general. We regard this perspective to be of high importance because physicians are a key target market of the Company. In addition, we believe that his length of time on our board has provided him with valuable, long-term knowledge of our operations and our products, which is particularly important given the significant change to the composition of the board in the last three years. Dr. Gearen was an associate professor of orthopedics at the University of Florida College of Medicine from 1993 to 2012. Dr. Gearen also was Chief of Staff at the Shands Hospital at the University of Florida and served as Assistant Dean of Clinical Affairs at the University of Florida College of Medicine from 1992 until 1999. Dr. Gearen was appointed Chairman of the Department of Orthopedics in May 2002 and stepped down as Chairman on June 30, 2010. Dr. Gearen retired from practice on June 30, 2012. Brian K. Hutchison: Mr. Hutchison joined RTI in December 2001 and was elected chairman of the board in December 2002. On May 5, 2011, Mr. Hutchison stepped down as chairman while continuing to serve as president and CEO and a member of our board. Mr. Hutchison spent the previous 12 years with Stryker Corporation. His last position at Stryker was vice president, worldwide product development and distribution. As the only management representative on our board, Mr. Hutchison provides an insider’s perspective in board discussions relating to the business and strategic direction of the Company and has experience in all aspects of the Company’s worldwide business. Mr. Hutchison’s length of service at RTI provides our board with detailed knowledge and unique perspectives and insights regarding the strategic and operational opportunities and challenges, economic and industry trends, and competitive and financial positioning of our Company and its business. Thomas A. McEachin: Mr. McEachin joined the Board of Directors in December 2015. Mr. McEachin’s finance and executive management experience provides our board with valuable financial reporting, compliance, accounting and controls, and corporate governance experience. Prior to his retirement in 2012, he served in executive capacities with Covidien Surgical Solutions, a division of Covidien plc, including vice president and group CFO. Prior to joining Covidien, Mr. McEachin served United Technologies in various finance capacities (1997-2008) and in various executive capacities with Digital Equipment Corporation (1986-1997) and Xerox Corporation (1975-1986). Shirley A. Weis: Ms. Weis joined the Board of Directors in October 2014. Ms. Weis’s background at the Mayo Clinic provides our board with valuable healthcare and business strategy. In addition, she has significant consulting and management experience, which has enabled her to provide valuable insight to our board. Ms. Weis is president of Weis Associates, LLC (a consulting firm focused on healthcare management, strategic planning and leadership development) and emerita vice president & chief administrative officer of Mayo Clinic. Ms. Weis has worked at Mayo Clinic in many different capacities since 1995 and was a member of the Mayo Clinic board of trustees and served as the secretary for the Mayo Clinic board of governors. Ms. Weis currently holds a position on the board of Sentry Insurance Company as well as advisory boards for American World Clinics and Women Business Leaders. Mr. Curtis M. Selquist and Mr. Christopher R. Sweeney, the Company’s two “preferred directors” and associated with our largest investor, Water Street Healthcare Partners, are appointed by holders of RTI’s preferred stock and not up for re-election at the 2016 annual meeting. Both these directors have deep expertise in the healthcare sector and experience working as directors to grow companies for the benefit of stockholders. Jeff Goldberg: The committee concluded that Mr. Goldberg’s primary experience as a lawyer was not the most appropriate background to add to the board at the current time, when RTI is primarily focused on driving revenue growth and controlling costs. Mr. Goldberg has significantly less operating, finance and sales experience, particularly related to medical device companies, than the board’s recommended nominees. Darren Lehrich: Based on a careful review of Mr. Lehrich’s credentials submitted by Krensavage, the committee concluded that Mr. Lehrich lacks direct in-depth knowledge and experience with RTI’s business and industry (specifically orthopedics and medical devices) and does not possess the skill sets that should be represented on the board. Furthermore, Mr. Lehrich does not possess experience as either a board member or executive officer. The committee also noted that Mr. Lehrich is the investor relations director for a company currently involved in a time-consuming initial public offering. The committee was concerned that the short and long term demands of Mr. Lehrich’s current employment position would interfere with his ability to devote the time and effort necessary to be an effective RTI board member. Mark Stolper: The committee concluded that Mr. Stolper did not fulfill the board’s pre-identified criteria for the addition of a financial expert with public accounting experience. The board placed significant emphasis on public accounting experience because the current chair of the three-person audit committee, Mr. Dean H. Bergy, a certified public accountant, and one of the current members of the audit committee, Mr. Philip R. Chapman, are retiring from the board at the upcoming annual meeting. In contrast, the board-recommended nominee Mr. Singer is a certified public accountant with experience at a big four accounting firm, in addition to having public-company CFO experience. Frank Williams: The committee concluded that Mr. Williams would not be a suitable addition to the board because his primary background is in banking, with a specific focus on mergers and acquisitions and leveraged finance. The committee considered that the Company’s primary focus is organic growth opportunities and the Company would benefit most from board members with significant operating, finance and sales experience in the life sciences industry. The committee also noted that, if needed, the board has the benefit of the transaction experience of Mr. Christopher J. Sweeney and Mr. Curtis M. Selquist, both current board members and representatives of Water Street Healthcare Partners, RTI’s largest investor. As mentioned above, Krensavage had originally proposed a slate of nominees that included John Watts, who was subsequently withdrawn by Krensavage. The committee and Mr. Watts determined that he would be a less qualified addition to the board given his skills and experience overlap with those of current board member Ms. Weis. As part of our commitment to good corporate governance, the nominating and governance committee continually reassesses the board composition and the need for new directors. In fact, prior to Krensavage’s notification of its intent to propose director candidates, the committee was already in the midst of an ongoing, proactive evaluation process of potential candidates in order to make changes to the board. We believe the three new director candidates we are nominating – Messrs. Thomas, Singer and Valeriani – represent a continuation of our ongoing, proactive effort to refresh the board, bring in new skill sets and enhance our ability to execute our strategic plan and deliver value to ALL our stockholders. When RTI’s new director candidates are elected to our board at the upcoming annual meeting, seven of our nine directors will have served in their positions for less than three years. We are always open to constructive input from our stockholders, and we respect the right of stockholders to nominate directors. We delayed the date of our annual meeting from its usual April timeframe in order to give the nominating and governance committee sufficient time to thoroughly review Krensavage’s originally proposed nominees before making its recommendation for nominees. Furthermore, our recently declassified board structure gives our stockholders the opportunity each year to vote on all directors (with the exception of the two directors appointed by RTI’s preferred stockholders, Water Street Healthcare Partners). We welcomed the opportunity to meet with Krensavage’s nominees. However, we are confident that our proposed slate of directors comprises the best candidates and will make for a strong and refreshed board that will help us in executing our strategic plan and enhancing value for all stockholders. We have outlined and continue to execute against a clear strategic plan to invest in our direct sales business and broaden our implant portfolio to include metals and synthetics, while controlling our operating cost base. In contrast, Krensavage has consistently failed to offer any plans or ideas despite the engagement efforts of our board and management team. We have aligned our organization with three key growth areas: 1) focused products that we expect to grow revenues at a 5-year compound annual growth rate approaching 50% and generate margins of approximately 70%; 2) hardware that we expect to grow revenues at a 5-year compound annual growth rate in the mid-teens and generate margins of approximately 70%; and 3) base biologics that we expect to grow revenues at a 5-year compound annual growth rate in the mid-single digits and generate margins of approximately 40%. We have grown our direct sales, which have higher gross margins than our commercial sales and greater predictability, from 40% of revenues in 2001 to 50% of revenues in 2015, and expect to grow direct sales to 60% of revenues in the long-term. We acquired Pioneer Surgical Technology in 2013 and have integrated the business, bolstering our direct sales channels and accelerating the diversification of our implant portfolio into metals and synthetics, while also adding a next-generation synthetic biologics platform. We believe we have developed a strong pipeline of new products to support future growth. For example, earlier this year we signed an agreement with Oxford Performance Materials to exclusively license its 3-D printing technology platform and proprietary OXPEKK® polymer to manufacture spinal implants for the U.S. markets. Additionally, so far this year we have introduced the Unison™-C Anterior Cervical Fixation system for stand-alone anterior cervical interbody fusion and deformity instrumentation for our Streamline® TL spinal fixation system. Both introductions are important and much-anticipated additions to our spine portfolio. We also expect the first human implantation of our long-term bovine project in mid-2016 pending ethical committee reviews. This is an exciting project that could revolutionize treatment for ligament reconstruction, which the bovine tendon would be the first product to have significant and relevant clinical data. These important steps are already delivering stronger financial performance. As detailed in our fourth quarter 2015 earnings release issued February 16, 2016, for the full year 2015, revenues grew 7.4% (9% on a constant currency basis), adjusted EBITDA, as detailed in the reconciliation provided at the end of this letter, grew 36.4%, and adjusted net income per fully diluted common share, as detailed in the reconciliation at the end of this letter, grew 109%. While we expect revenue growth in 2016 to moderate due to the outperformance of our commercial business in 2015, we expect both our commercial and direct sales businesses will continue to perform in line with our long-term expectations and our direct sales business is expected to grow in the mid-teens year over year in 2016. We believe our value-creation strategy is gaining traction and we are well positioned to achieve our long-term financial targets and increase value for ALL stockholders. It is important for you to disregard any material sent to you by Krensavage. We urge you to protect your investment and vote the WHITE proxy card today FOR all of RTI’s highly qualified director nominees: Peter F. Gearen, Brian K. Hutchison, Thomas A. McEachin, Jonathon M. Singer, Paul G. Thomas, Nicholas J. Valeriani and Shirley A. Weis. RTI Surgical has filed a definitive proxy statement with the U.S. Securities and Exchange Commission (“SEC”) in connection with the solicitation of proxies for its 2016 annual meeting of shareholders. Shareholders are strongly advised to read RTI’s 2016 proxy statement and the accompanying WHITE proxy card and other documents filed with the SEC when they become available because they will contain important information. Shareholders will be able to obtain copies of RTI’s 2016 proxy statement, any amendments or supplements to the proxy statement and other relevant solicitation materials filed by RTI with the SEC in connection with its 2016 annual meeting of shareholders free of charge at the SEC’s website at www.sec.gov, on the company’s website at www.rtix.com, or by writing to our Corporate Secretary at our principal office at 11621 Research Circle, Alachua, Florida 32615. RTI, its directors, and its executive officers may be deemed participants in the solicitation of proxies from shareholders in connection with its 2016 annual meeting of shareholders. Information concerning persons who may be considered participants in the solicitation of RTI’s shareholders under the rules of the SEC is set forth in public filings filed by RTI with the SEC and in the definitive proxy statement relating to its 2016 annual meeting of shareholders. This communication contains forward-looking statements within the meaning of the Private Securities Litigation Reform Act of 1995, including those statements regarding the further strengthening of our board when RTI's new director candidates are elected, our strategic plans to grow, improve profitability and enhance value for all RTI stockholders, our financial goals, our progress towards executing our strategy, and our expected growth in 2016. These forward-looking statements are based on management’s current expectations, estimates and projections about our industry, our management’s beliefs and certain assumptions made by our management. Words such as “anticipates,” “expects,” “intends,” “plans,” “believes,” “seeks,” “estimates,” variations of such words and similar expressions are intended to identify such forward-looking statements. 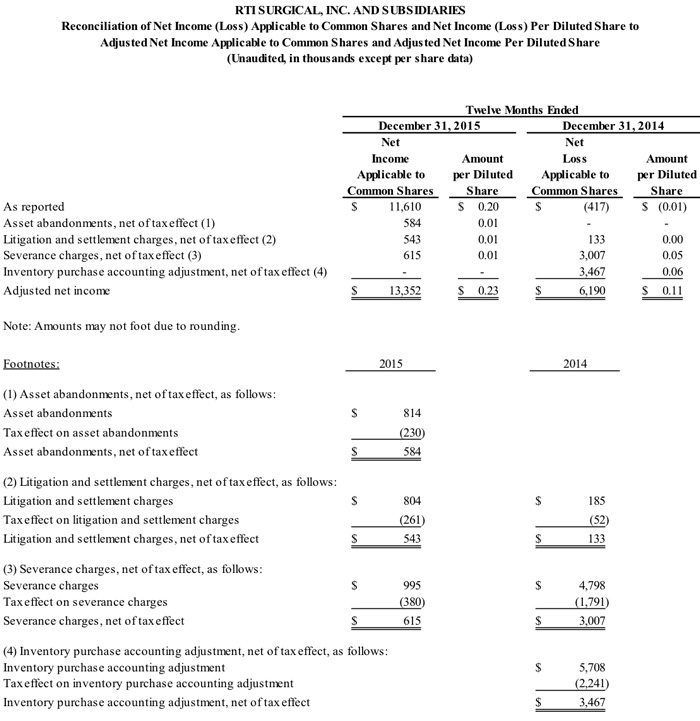 In addition, except for historical information, any statements made in this communication about anticipated financial results, growth rates, new product introductions, future operational improvements and results or regulatory actions or approvals or changes to agreements with distributors also are forward-looking statements. These statements are not guarantees of future performance and are subject to risks and uncertainties, including the risks described in public filings with the SEC. Our actual results may differ materially from the anticipated results reflected in these forward-looking statements. Copies of the company’s SEC filings may be obtained by contacting the company or the SEC or by visiting RTI’s website at www.rtix.com or the SEC’s website at www.sec.gov.